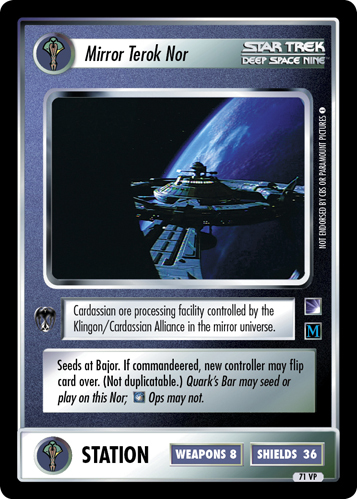 Cardassian ore processing facility controlled by the Klingon/Cardassian Alliance in the mirror universe. Seeds at Bajor. If commandeered, new controller may flip card over. (Not duplicatable.) Quark's Bar may seed or play on this Nor; Ops may not. Image Source: Deep Space Nine: "Crossover"